Many of us like to organize time by setting yearly goals. It provides a focus and brings a little order to a chaotic world. 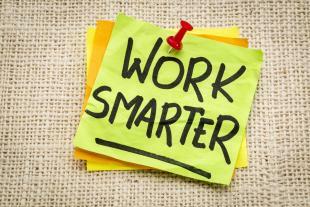 This year, I’d like to focus on working smarter and using more streamlined strategies. So here are the things I hope to focus on this year. Better Educate Clients. One of the ways to streamline project-oriented work is to better educate our clients. I spend a lot of time at the start of projects by listening to client issues and asking questions. In addition to this, I want to spend more time at the start by informing clients about the design process and about how people learn. Some education on what clients can expect goes a long way toward making things smooth. Even more important, though, is helping clients understand that humans can only process a small amount of information at one time and that continuous learning is more effective than one-time events. With a shared understanding of how people learn, we can be true partners in designing the best solutions to whatever performance or knowledge gaps we are trying to close. Collect Patterns. Many design fields collect solution patterns to common challenges and we need to do more of this too. It’s another way to streamline our work. In the field of user interface design, you can find patterns for different ways to collect input or to navigate. In learning experience design (LX Design), we should be collecting successful patterns in one place for designing drill and practice activities, scenario-based problem-solving, short-answer test questions, etc. This would be a resource for LX Designers. I hope to team up with some colleagues this year to start some work on this. Streamline With Apps. I would like to take the time to explore the tools and apps that can help me do my work and run my business in the most effective way possible. I think many people are working toward this type of goal, but it takes time and effort to discover, filter and learn which tools are the best for one’s situation. I’d like to streamline work by using the right tools at the right time. As I learn from focusing on these three areas, I will write about and share my findings on The eLearning Coach site if I think it will be of interest to others in our field. Happy New Year! You can find Connie Malamed, the eLearning Coach, on Twitter, Facebook and on her site.